I am pleased to recently meet, Valerie Hirschfield, the mother of three boys who will kick off Fall with the September SUP 11-City Tour in Holland. The Tour is an ultimate challenge and also a unique experience in which paddlers travel 220 km (136 miles) in five days with weather conditions varying from windless and beautiful to sunny, or cold and rainy. Ultimate challenge is exactly right for Valerie, who lives her life with zesty energy, a powerful attitude, tenacity and the ability to inspire. 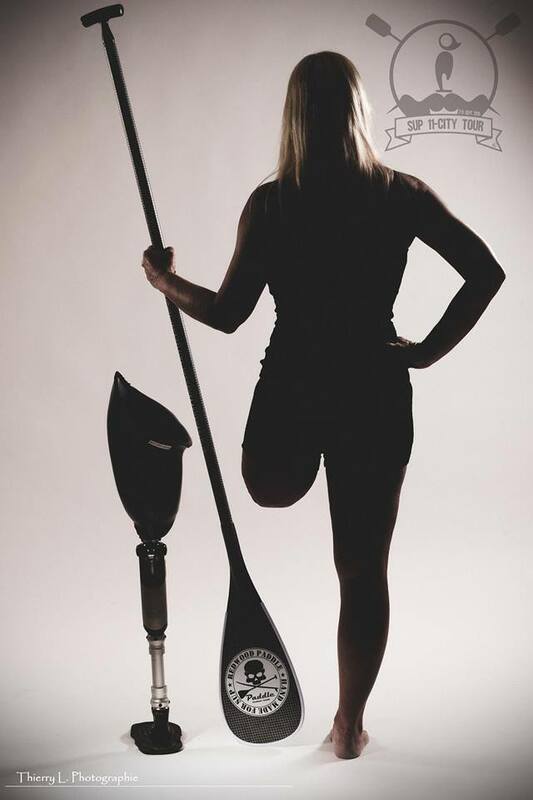 You will notice in her photo that Valerie standup paddles with a challenge that might daunt most. While 200+ paddlers race and cruise past open fields with windmills, cows, and sheep and encounter eleven historical cities Valerie will be unique in that she is the first to participate in the event after the loss of a leg. 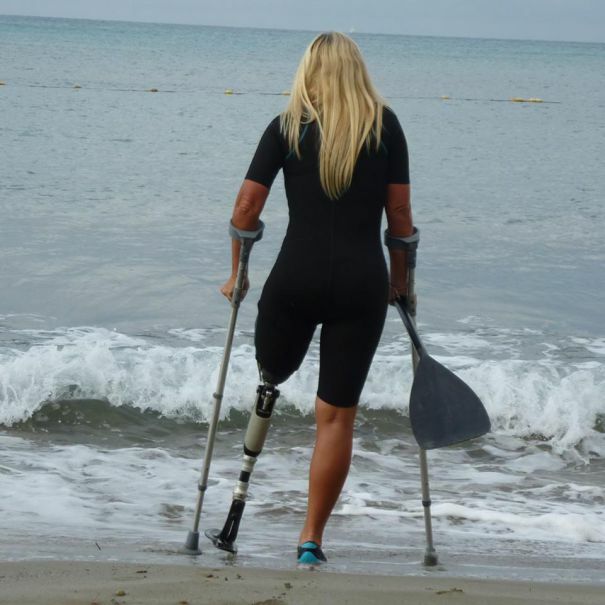 Most of us would have trouble simply standing with a prosthetic leg, but Valerie has dedicated her love of SUP to finding the right training that will allow her to reach the skill level she wants and needs for events like this. Many elite water athletes have participated in the Tour including Connor Baxter, Zane Schweitzer, Marc Raaphorst, Donna Raaphorst, Eric Terrien, Bart de Zwart and Byron Kurt , Karen Wrenn, Jenny Kalmbach and Anne-Marie Reichman. After tennis, climbing – and even the challenge of walking, Valerie made the commitment, entered the event and is enjoying a summer of specific training. You can help too, Click to reach her non-profit organization page for information. You can help by simply SHARING this post on your Facebook. Here’s a bit about Valerie. She’s about to be 51 years old, mother of three sons, wife, girlfriend, diligent and persevering sporty, beautiful and brave … beyond any test. Many decades ago she had to wage her toughest fight against a disease that took her leg but not her will to survive and thrive. Valerie looks forward to meeting you all and sharing the Holland 11-City Tour through photo updates on her site. 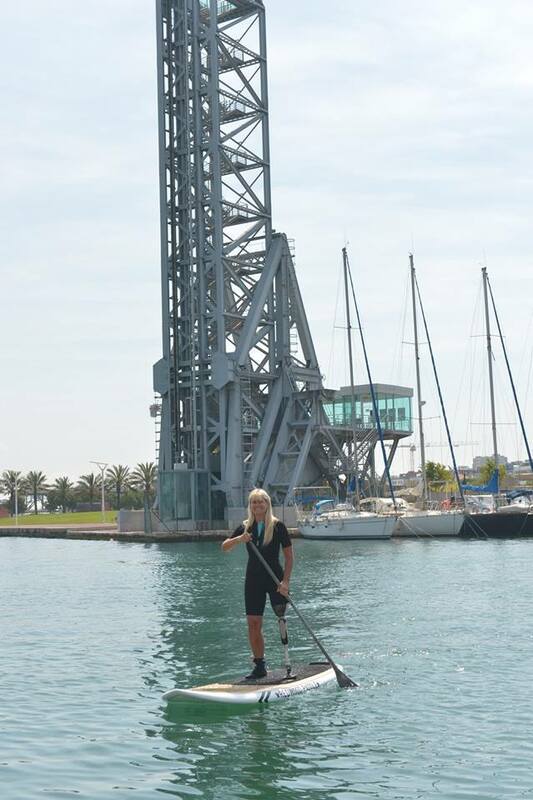 This entry was posted in Journeys and Quests, People and tagged SUP Racing, Valerie Hirschfield. SUP 11 City Tour by Water Words. Bookmark the permalink.